I always find learning about seeds and plants so interesting. It was one of my favorite science topics when I was teaching. There is so much to observe and so many fun ways to initiate learning. My "Go To" experiment has always been growing lima beans. It is simple, offers quick results and boy, do these little beans grow! We started our activity by observing the lime bean seeds. Then we came back to see if anything had happened to them. 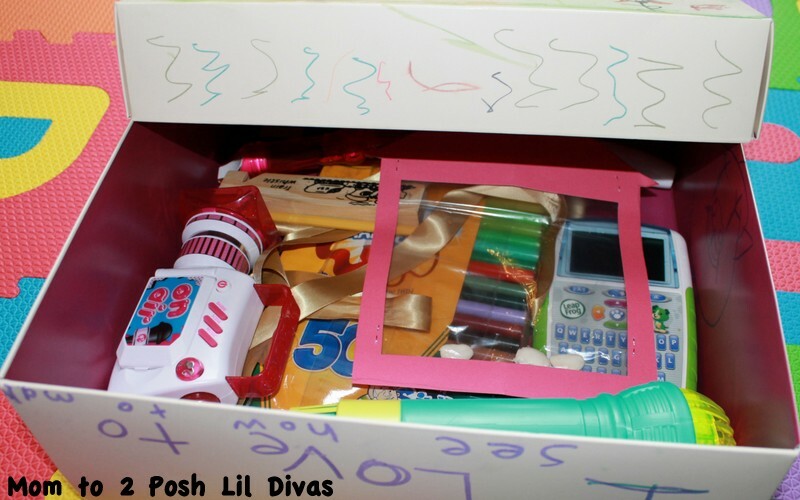 The Lil Divas were thrilled to see the changes and couldn't wait to get hands-on. We observed the outer layer which was now coming off the seeds after being soaked and I told them it was called the seed coat. We discussed how the seed felt - hard and smooth. The Littlest Diva was quick to point out that something had sprouted from the bean. I had them find the embryo of each seed and we discussed what they thought would happen to it. They both thought the plant would grow from there. We split open a few seeds and observed the insides. We saw the embryos up close and I pointed to where the leaves would grow. 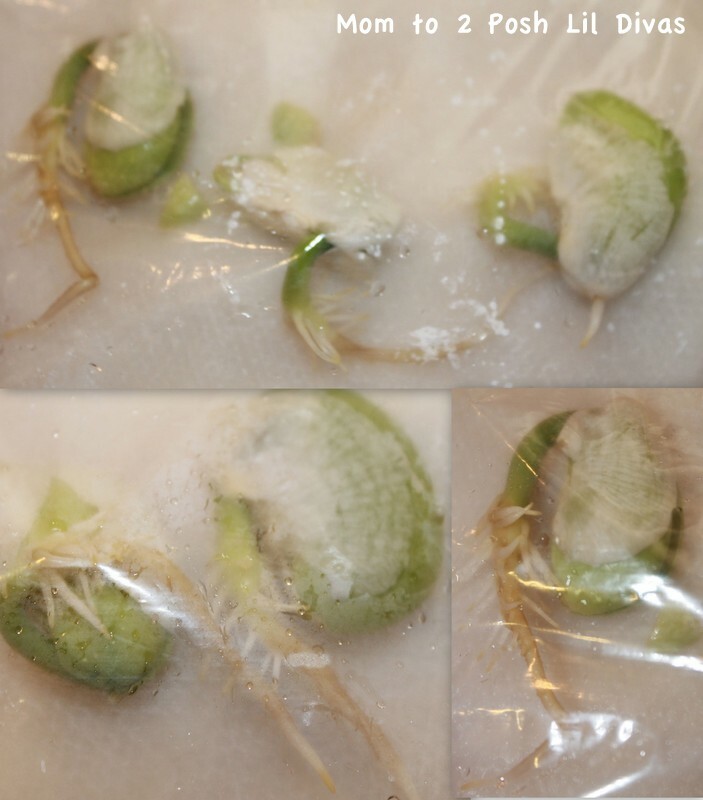 I also told them that the bean itself has stored food inside (cotyledon) which will nourish the growing embryo. The Lil Divas were amazed at how much you could see from just the seed. Next, we moved on to our growing experiment. sunlight, air, water & food. 1. 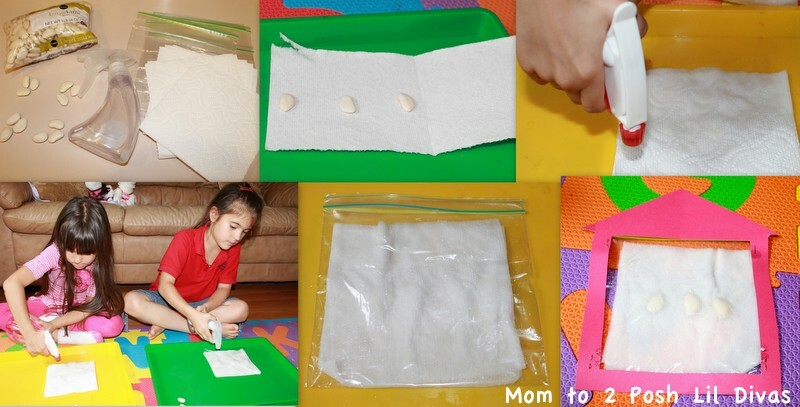 Take half sheet of paper towel and fold in half. 2. 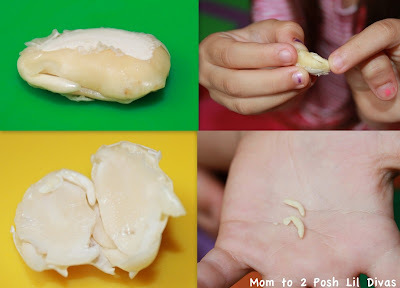 Place 3 lime beans inside, leaving space in between each. 3. Fold paper towel closed and using spray bottle wet the napkin. 4. Place in a ziploc baggie - be sure to leave open for air. 5. Hang in a sunny spot. For our experiment, we also wanted to see what would happen if seeds did not get what they needed to grow. 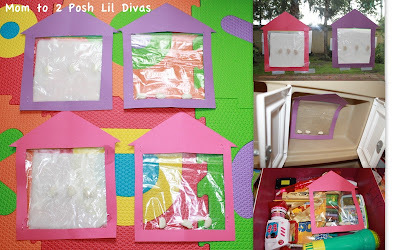 So, we put a few lima beans into baggies without water, sealed them tight to keep out air and placed them in dark spots - the Lil Divas chose to put them inside a box and in a cupboard of their play kitchen. Then, we observed the results and made sure to keep our seeds/napkin moist by adding water when needed with the spray bottle. After a few days, we were able to see the roots and the beginnings of a leaf sprouting. 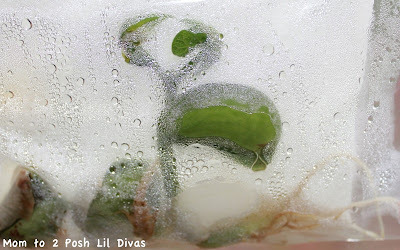 Within the next few days, you could clearly see the leaves growing. 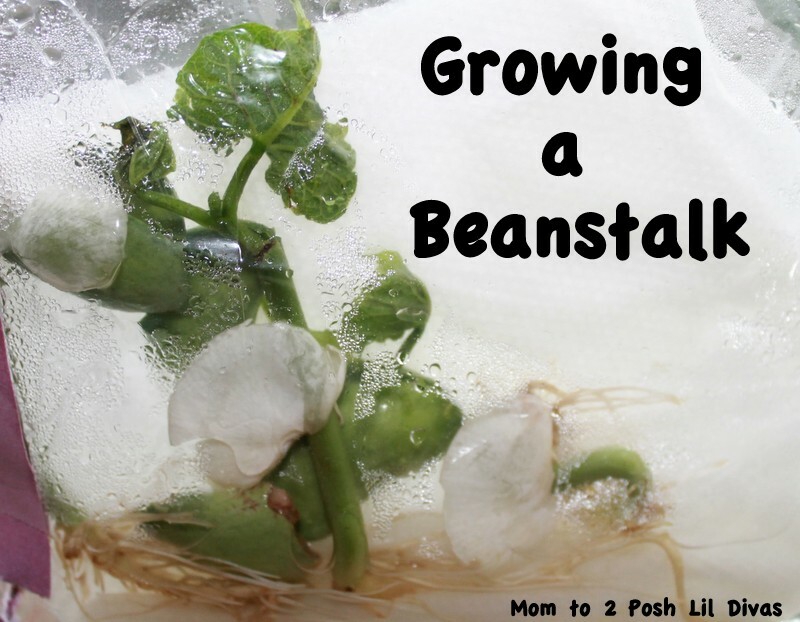 After about a week and a half we had our own little baby beanstalks as the Lil Divas called them. 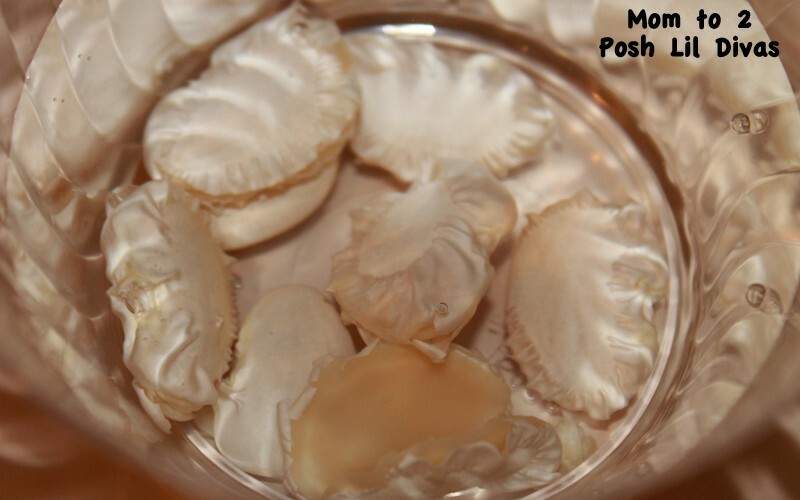 What happened to the seeds that didn't receive sunlight, water & air? It was wonderful to compare the two and see how important sunlight, water & air are for growing plants. Have you done any gardening, plant experiments or flower activities with your children or students recently? to bring you The Flower, Plant & Garden Blog Hop! flower, plant and/or gardening fun with kids. Love the greenhouses you made! Adds so much creativity to this classic experiment. Thank you for sharing. 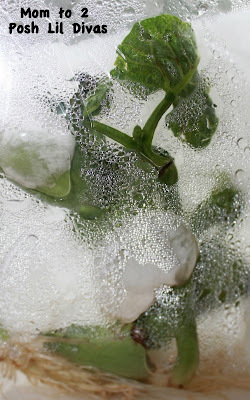 This was one of my favorite science experiments. I made my first video about it. You guys did it really cool. I love the greenhouses! So cute! We did a similar experiment but next year we'll try putting the baggies in the sun and out of the sun. Great teaching point. Also, I created a booklet to record your data on my post if that interests you!